Operating in a legal gray area, the mobile needle exchange program brings needed supplies and a message of hope to people struggling with substance use. LEWISTON — The Church of Safe Injection doesn’t have stained-glass windows, pews, hymns, organs or an altar. Not a single chalice or robe is in sight on the dark, cold and clammy streets of Lewiston. The church is located behind founder Jesse Harvey’s blood-red Honda Fit – hatchback open – parked on Spruce Street across from Kennedy Park. The Church of Safe Injection will be hosting events in Lewiston where those in recovery can obtain sterile needles and syringes, naloxone, condoms, food and other items. They will be on Spruce Street in Lewiston, across from Kennedy Park, on Wednesdy, Nov. 7 and Nov. 28. They start at 8:30 p.m. and generally run for about 90 minutes to two hours. Those interested in learning more about the Church of Safe Injection can go to www.facebook.com/safeinjection. The subcompact car is packed with what Harvey calls the “body and blood” of the church: sterile needles, the lifesaving heroin antidote naloxone, condoms, alcohol wipes. Overripe bananas, potato chips, voter registration cards and bibles also vie for space. 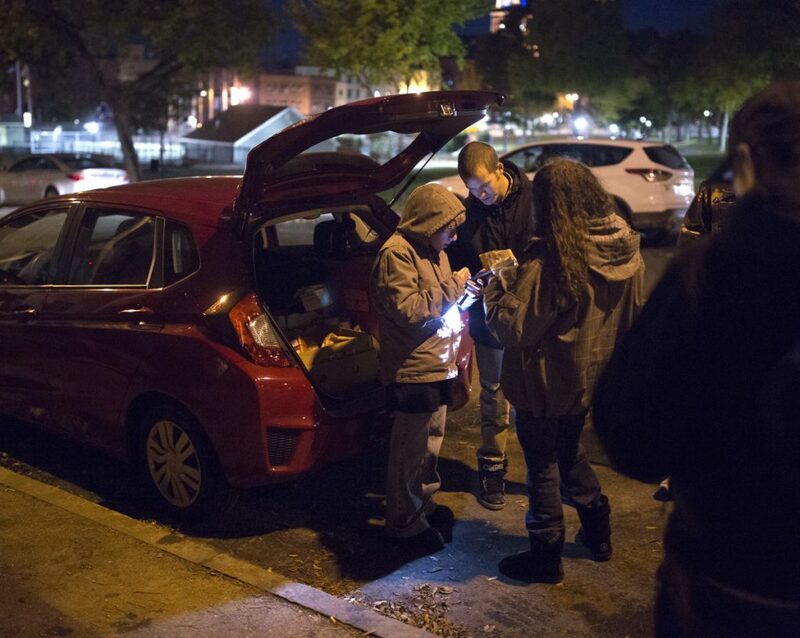 Huddled around the car one night last week were a few volunteers and, at times, people looking for salvation from their substance use disorder. Harvey, 26, runs sober houses in Sanford, Lewiston and Auburn, and is a peer support coordinator at Greater Portland Health. His talk is practical, logistical: Here’s how to use naloxone. Call 911. Harvey doesn’t have a degree in theology and has never been a pastor. He calls himself a “disciple” of the church, which is not yet formed as a nonprofit, although he intends to do so. Jesse Harvey holds naloxone, the heroin overdose antidote, which he gives out to people who may need it. Harvey, 26, runs sober houses in Sanford, Lewiston and Auburn. Harvey’s growing group of volunteers has a Facebook page, the car, supplies from an unnamed donor, and the determination to do the work and worry about potential consequences later. Whether the Church of Safe Injection is operating within the law is unclear. Gordon Smith, executive vice president of the Maine Medical Association and an attorney, said the Church of Safe Injection has laudable goals, but is in a legal gray area for how it distributes sterile needles. But church leaders and volunteers are undeterred. 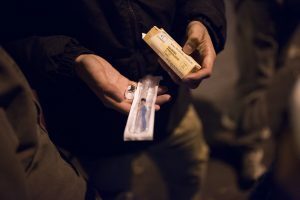 The Church of Safe Injection is in many ways a mobile needle exchange program, similar to those that operate at fixed locations in Portland, Bangor, Ellsworth, Machias and Augusta. They aim to reduce diseases caused by sharing used needles, such as AIDS and hepatitis C. The goal is to keep people alive until they are able and willing to get into recovery programs. The opioid epidemic has fueled a surge in hepatitis cases, with 256 hepatitis B cases and 1,908 hepatitis A cases in 2017, the highest levels in at least a decade. Although needle exchanges can be politically controversial, a 2018 report by the Maine Department of Health and Human Services cites research that shows they are effective in preventing hepatitis and other diseases. More than 5,200 Mainers used the exchanges between November 2016 and October 2017. Naloxone, which acts as an antidote to opioid overdoses, has saved lives at a time when overdoses are claiming hundreds of lives a year, including 418 Maine deaths in 2017 and 180 in the first six months of this year. Naloxone is now more widely available than a few years ago and can be purchased without a prescription but would cost about $30 to $125, depending on what type of kit is bought. Harvey said that for some drug users, the monetary barrier and perceived stigma of buying the drug at the pharmacy is preventing some from getting the lifesaving antidote. So the Church of Safe Injection gives naloxone away. The program also accepts used needles, which it keeps in a sterile container and drops off at needle exchanges in Portland or Bangor. Harvey said the church financially is starting with less than $1,000 in funding, plus $1,000 worth of supplies from a donor he would not identify. Lewiston has been the focus of attention for the church, with four visits there already and three more scheduled into November. The red Honda is typically parked on the street for about two hours, starting at 8:30 p.m., depending on weather and turnout. So far, a few dozen people have received the supplies. The Church of Safe Injection also held an event in Biddeford in October and is planning events in Sanford. Lewiston closed its needle exchange program in 2017, at the same time that Maine experienced an all-time record number of drug overdose deaths. The opioid epidemic has been a topic in many candidates’ Nov. 6 election campaigns, and all of the candidates for governor have touted their plans to address the issue. But Harvey said Maine is in crisis and the time to act is now. “I want people to be able to make it alive to my sober houses,” he said. The Church of Safe Injection is attracting people like Kandice Child, 44, of South Paris, who is in recovery and has an adult son who uses opioids. “I’m trying to keep him alive until we can get him help,” said Child, who volunteers with Harvey and also receives supplies. Last week, she obtained sterile needles and syringes and naloxone, some of which she planned to keep for her family and some to distribute to people she knows. How the Church of Safe Injection tries to help – by distributing packages with sterile needles and syringes – is treading on murky legal ground. Even so, Harvey is forging ahead. Some health care experts don’t have the same certainty. A brick-and-mortar needle exchange program must be licensed by the Maine Center for Disease Control and Prevention. These people are permitted to take more needles, naloxone or other supplies than they personally need and distribute the extras to others. That’s a way to get the supplies to underserved and rural areas, Miller said. Harvey showed the Press Herald a laminated card designating him as a “secondary exchange” recipient for the Portland and Bangor needle exchange programs. However, Miller said, there’s also a Maine law on the books that bans people from distributing syringes, so there’s a potential legal conflict. Denis D’Auteil, Lewiston’s deputy city administrator, pointed out that needle exchange programs are licensed by the state. “Any program, including a mobile site, is required to carry a copy of their certification,” D’Auteil said. The Church of Safe Injection is not licensed by the state, but Harvey said as a mobile site affiliated with existing needle exchange programs, it doesn’t need to be. Harvey also points to a 2006 U.S. Supreme Court decision that exempts religious organizations from the federal Controlled Substances Act. The Supreme Court ruled that a church in New Mexico could use a hallucinogenic tea in religious services and not be in violation of the law. Smith, the medical association executive who represents doctors before the Legislature, said Harvey’s claim to a religious exemption “does not pass the straight-face test,” but he noted that needle exchanges work and said Maine should try to open more of them. “We need a lot more harm reduction in this state, and we need more needle exchanges in places that don’t have them,” he said. In any event, the idea seems to be spreading. Harvey said people he knows have started Church of Safe Injection branches in Bangor and Augusta, Philadelphia and West Virginia. All he requests is that the church be interfaith, support people who are marginalized and espouse safe injection practices for those suffering from substance use disorder. Harvey acts as an adviser to help those programs get started. He said the back of the Honda Fit is not a long-term answer, and he hopes to eventually open brick-and-mortar needle exchange programs in Lewiston or other places that need them. But for now, they will keep handing out supplies from his car, while trying to stay warm with coffee, hoods and gloves. Eddie Greyfox, 42, of Lewiston, said he’s a believer in the Church of Safe Injection, a volunteer and a person in recovery. Correction: This story was updated at 7:55 on October 31, 2018 to correct the name of the organization that operates needle exchange programs in Bangor, Ellsworth and Machias.